The Final True Edition 25-June-06 of the map Arhabeach TE by B0n3g1b has a couple of texture errors. "Couldn't find image for shader models/mapobjects/vehicles/luv2"
Servers and clients place z_arhabeach_te_texturesfix.pk3 into your etmain folder. 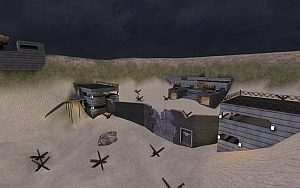 Arhabeach was play tested a number of times on the nedETPRO custom maps nights and became a popular map on the server. [D3] Last Man Standing mod v3.5 released!